A life insurance policy with an adequate risk coverage is a must in every individual's financial portfolio. But, it is also important that the right insurance policy is bought keeping in view the right needs. With so many insurance products available, conducting a proper evaluation can become quite a task. Taking the help of an insurance adviser or agent can help solve this problem. An insurance adviser can play the part of the direct link between the insurance company and the individual. He is the one who can help you select the right policy i.e. one which can help you fulfil your insurance needs. But for this, it is important that you connect with an proper and qualified insurance agent. 1. Is your insurance adviser certified? Before selecting an insurance adviser, you should ensure that he has the necessary IRDA (Insurance Regulatory and Development Authority) certification. IRDA has laid down certain guidelines, which need to be followed by every individual to qualify as an insurance adviser. Only on the completion of these requirements, an individual is given license by IRDA and allowed to sell insurance policy. Therefore, before selecting an agent, you must ensure that he has acquired the necessary qualifications and that he holds a valid license to sell insurance. 2. Does he offer investment solutions? 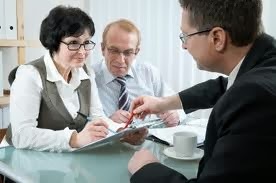 You should understand that the job of an insurance adviser is not limited only to selling insurance i.e. providing the insurance form, getting the same filled and submitted. Instead, with the changing scenario, now your insurance adviser is required to have a comprehensive understanding of your requirements and accordingly he should be equipped to offer you the policy that best suits you. Thus, his job has been extended to advising clients rather than simply selling insurance. 3. Does he have detailed product knowledge? The insurance adviser should have an in-depth knowledge of all the products that his insurance company offers. It has been observed many a times that the adviser does not possess complete and accurate information about the products that he is selling. In our view, an adviser should not only have detailed information about all the products that his company offers, but also he should be well versed about the products from other life insurance companies, in order to give a comparative opinion. 4. Will he provide timely after sales service? The job of an insurance adviser does not end once the policy has been bought. He should provide you with regular updates on the policy status in terms of premium payments, declaration of bonus and any other important inputs that you need/would like to know. Not only this, your insurance adviser should also keep you updated about the new policies that can help you to reach for your financial goals. 5. Is he aware of all the formalities to be fulfilled towards claim? An adviser assumes an important role at the time when a claim arises, as he is the sole contact point between the policyholder and insurer. He should have clear understanding of all the formalities that need to be fulfilled if needed at the time of claim. So while deciding make sure that an insurance adviser should be more than a sales-man who pushes products that help minimise your tax liability. Insurance is a long-term commitment and could be needed at different points in time in one's life. Therefore, the adviser should be competent enough to service all your requirements by providing comprehensive insurance-based solutions.